Buy Green Cuisine Arrowroot 50g in the UK from our online shop or directly from our independent Scottish store. The starch extracted from the tuberous roots of a perennial plant indigenous to Central America but now also cultivated in Africa and South East Asia. Widely used as a thickening agent as it produces a thick gel when mixed with hot water. In the past this was considered a useful source of nutrition for those with weak stomachs. Muffins with seasonal fruit and Yogi Rose tea, what a wonderful combination! This recipe contains 40g arrow root. We sell real Green Cuisine and other Herbs & Spices directly from our shop in Scotland and online throughout the UK. View more products from Green Cuisine. Where can you buy real Arrowroot 50g safely online? If you are wondering where you can buy Green Cuisine Arrowroot 50g safely online in the UK, then shop with us. 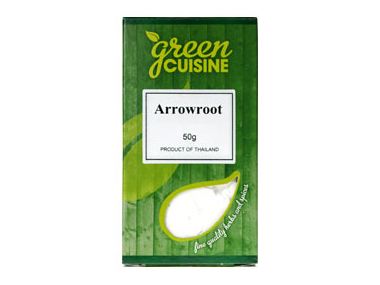 Arrowroot 50g - Green Cuisine Arrowroot 50g in Herbs & Spices and Herbs, Spices & Salt.